President Donald Trump has fired Acting Attorney General Sally Yates after she questioned the legality of his immigration ban. Sally Yates, who had been appointed under President Barack Obama, earlier ordered justice department lawyers not to enforce the president’s executive order. Dana J. Boente, US attorney for the Eastern District of Virginia, replaced Sally Yates as acting attorney general. He has directed the department to enforce Donald Trump’s order. In a statement, the White House said Sally Yates had “betrayed” the department. Donald Trump’s order temporarily banned nationals from seven Muslim-majority countries from entering the US, and sparked street protests in the country and abroad. In a letter, Sally Yates had said she was “not convinced” that the president’s order was lawful. 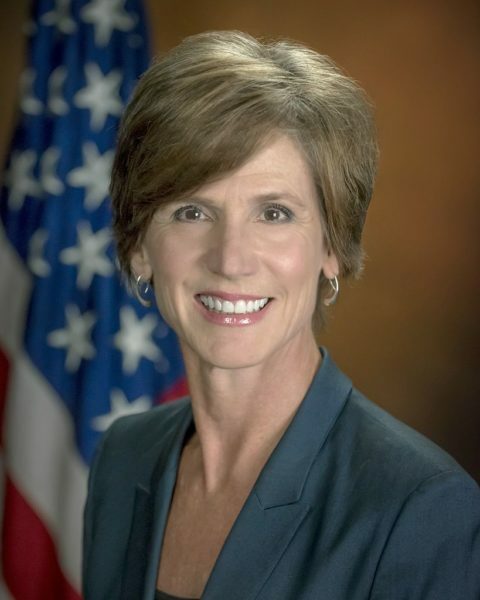 Sally Yates had “betrayed the department of justice by refusing to enforce a legal order designed to protect the citizens of the United States”, a statement from the press secretary said. The statement also described her as “weak on borders and very weak on illegal immigration”. Sally Yates’ replacement, Dana Boente, was also appointed by Barack Obama, in 2015. He was confirmed by the US Senate – making him eligible for appointment while President Trump waits for his own nominee to be approved. Meanwhile, hundreds of diplomats and foreign servants have been drafting a “dissent cable” to formally criticize Trump’s executive order. The White House has consistently defended Donald Trump’s executive order despite the controversy, with press secretary Sean Spicer saying diplomats should “get with the program”. Commenting on the protests about the immigration order, Barack Obama said he was “heartened”. Donald Trump also replaced the acting director of the US Immigration and Customs Enforcement, Daniel Ragsdale, who has been in the post since January 20. He is the former deputy director.